The interview was conducted in Kyiv, Ukraine following a lecture by Nick Dyer-Witheford at the National Technical University of Ukraine “Kyiv Polytechnic Institute” (NTUU KPI). We would like to thank those who brought this lecture and text to life, namely Yurii Dergunov, Volodymyr Ishchenko, Serhiy Odarych, Alona Liasheva and clearly Nick Dyer-Witheford. Starting from the era when a strong Marxist sociology developed, including structural functionalism, communicative approaches, the Frankfurt school, etc. In your opinion, to what extent does it make sense to use Marx’s dialectical approach for analyzing phenomena of robotization, mass communication, information revolution, developments that Marx and his followers could not even imagine, especially taking into account the mechanisms of governing, control, and violence concentrated in the hands of the ruling class? Is this approach universal, could be it based on the universal solidarity of all people, regardless of their class? Yes, I think so. That’s why I work within the Marxian tradition. I think the Marxism we have today is not the same Marxism as we had at the moment that Marx completed capital. Because it is not only the continuing revolutionary tradition, but it is a continuing learning tradition. So the validity of Marxism continues if only we have the persistence of capitalism as the dominant mode of production. Obviously there are aspects, which go beyond what Marx could observe in his time. But many of the aspects of his analysis of the logic of the system persist, so contemporary Marxism has to be a mix of things that stay constant and things that change. Some of the things that change I believe may have to change quite radically. The Marxism we have today is, for example, a Marxism that had a serious encounter with feminism, with environmentalism, because probably in these two areas, on issues of gender and on the issue of relations with nature, Marx was mostly a man of his age, 19th century. But revision can be a profound process. I believe there is still an enormous amount to be learned from it in regards to the basic logic of capitalism. You just mentioned that there are things that stay the same and there are things that change in the theory itself. But what has changed in the society since the time Marx was writing his works? And how do we need to analyse them now? Some issues that have changed are the intensification of the tendencies that were already recognised by Marx. For example, the growth of computerisation and networks can be explained by extrapolating elements of Marxist theories of capitalist machinery and the growth in the organic composition of capital. Similarly, one can look at things that seem quite new like financialisation, but one can find in Volume 3 of Capital or elsewhere in Marxist works suddenly the general elements for an analysis of that. Is there a need to correct Marx’s Labour Theory of Value? Which exactly political economy categories could be used to explain accumulation of surplus value in software production and Internet-resources? In some of his work and most famously in the fragment on machines Marx did hypothesize a situation in which the very operations of the Labour Theory of Value would work towards that theory’s supersession. That’s where we are, that’s what we need to understand. How the Labour Theory of Value is to be superseded on the basis of the Labour Theory of Value. In other words through the drive of capital constantly gives us its labor costs by increasing its organic composition. So in a sense we are in a twilight zone, where the Labour Theory of Value is not completely true, nor completely false. On the subject of ‘surplus-population,’ Niklas Luhmann in “The Society of Society” directly says that contemporary communication networks, the extreme acceleration of the production of the means of production, the automation of production, and the general influence of capital on the minimisation of costs, which is reflected in neoliberal ideology, transform large numbers of the traditional proletariat – involved in the emergence of these technologies – useless. Is there something that could be offered by democratic forces to these Malthusian outcomes? I do not think it is a Malthusian conclusion, it is Marxian conclusion. Marx’s point was not about a surplus population created simply by natural processes. He was talking about populations that are surplus in terms of capital’s requirements for wage labor. That is a very different thing. I think, all the progressive socio-economic possibilities that we have been discussing would be very far from having surplus populations. If we had massive programmes of ecological restoration on a planetary basis or if we had global health projects, there would be no reason why anyone should be part of the surplus population. If you look at the Marxian definition of proletariat, he in fact emphasises that the proletarian is just as likely to be unemployed as employed. In the young Marx he talks about what he calls the proletarian risk of descending from the full void of unemployment. In other words, to be exploited to the empty void of unemployment, when you are not even necessarily worth enough for the system to be exploited. That’s an aspect of Marxian theory of dynamics, which during the Fordist years, in the North West it was a period of relatively high employment, was very much neglected. But certainly with the 2008 crash there has been excellent theoretical work reviving that question, particularly, the British marxist collective “Endnotes”. In a way my work is an attempt to do the information and technological side of the “Endnotes” analysis. 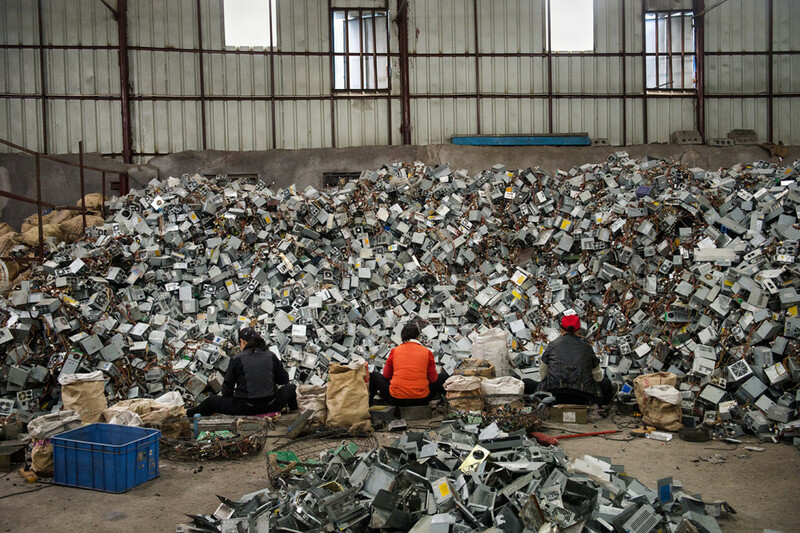 E-waste processing facility in China. Often analyses of information society are reduced to the emergence of new professional groups in the most developed countries. What position do workers, including those in the Third World who are involved in information and material production, have in the class structure of the digital era? What role do they play? A major one. If you follow the supply chains of cybernetic capital. The top, let’s call it that way, are not always, but often quartered in the North America or Western Europe. That’s where you find the high-level professionals. As you descend down the supply change you find these various strata of proletarianisation running the factory work in Southern China or other export zones, which is indispensable to manufacture all the hardware, on which everything runs, and then down into the sort of obscenities of extractive industries and toxic e-waste, creating global sacrifice zones. And even if we start to move back up the supply chain again, there are all these layers of various types of service workers or so called white-collar workers, who are implicated in these highly routinised types of work like call-centers, which can be involved in selling everything including selling cybernetic services. Providing the service of the service calls for Apple or Microsoft. And actually trying to follow those various working class strata who are, as you say, who have basically disappeared and are invisibilized by this discourse about digital professionalisation. That’s why I decided to write my book “Cyber-Proletariat”. I did a lot of work on the video-game industry and as you start to dig down through that, you discover all these places. I think it is part of the message I am trying to bring. Despite all this discussion, either in terms of bourgeois discourses of professionalisation, or in terms of left discourses about material labor, there are huge numbers involved in both the most routinised and the most brutal forms of proletarian work. We could say that now there are two models in the development of the Internet. The first one, the mainstream one, is globalisation, it is mostly lead by the services like Google, Youtube, etc. But if we take a look at countries like China or Iran, they are closing up their Internet space. Do you think there is a danger of fragmenting the Internet following the examples of China, Iran, and Russia? Yes, I think there is. I think that the dangers of national restrictions on the Internet space sit in a dialectical relation to the other side of the universality of the Internet, which is American imperialism. The openness of the Internet is some sort of technological equivalent of free trade doctrine. And because this is not an egalitarian universalism that has been imposed from a position of power it is not unsurprising that it elicits reactionary and authoritarian repressive forms of national control. But I think it is really important to see that the one conditions the other. One can throw up their hands at the regressive nature of Iranian or Chinese Internet policies, but this ignores the fact that the Google version of the world is meant to assist American command and penetration of the world’s economies. I would argue that those, the universalist and nationalist model, are two hearts of an equation that ultimately has no satisfactory answer. Furthermore, these national policies intensify the class struggle in those countries. For example, in China, which has quite highly authoritarian censorship policies, in fact the Chinese government is finding it extremely difficult to deal with this very well informed young migrant work force, which is really taking over the factories fighting in some ways the truly classic proletarian struggle via mobile phones. This is another way of saying that it is important to see these processes not only in terms of different logics of global and regional capital, but also to see them in perspective of contradictory logics of capital and what I call the global proletariat at different levels of struggle. So maybe China in a certain sense has a much more conversant Internet culture in some way at this point, because of the the high levels of class constitution, which is taking place. Whereas in North America, yes, the Internet is much more free, but there is not much of class struggle going on. 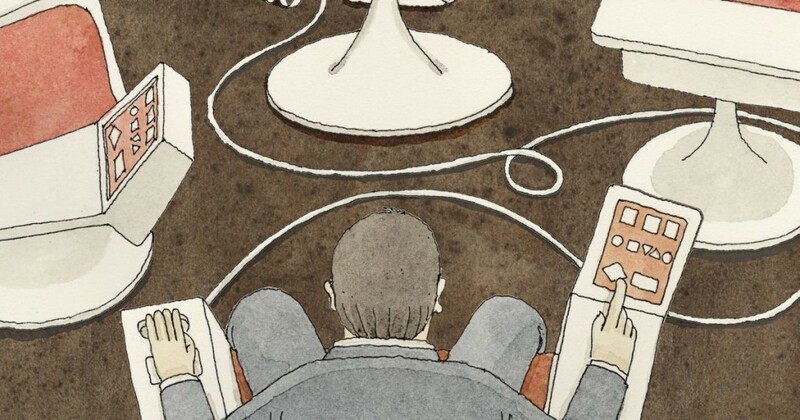 “In Allende’s Chile, a futuristic op room was to bring socialism into the computer age” (Illustration by Mattias Adolfsson, quoted and first appearing in The New Yorker, 13 October 2014). How do you evaluate attempts towards the collective use of cybernetic technologies in the 20th century, namely the project of Victor Glushkov in the USSR and Stafford Beer in the Chile of Allende’s time? I think they are incredibly important. I wrote a paper named “Red plenty platforms” a couple of years ago, which is about the possibilities of a contemporary version of that vision of progressive cybernetics. In fact it takes its title from a historical novel written by a British author Francis Spufford, which came out in 2011 called “Red Plenty”, which is a brilliant fictionalised account of the struggles over Soviet cybernetics policies in the 1960s and 70s. The thing which was interesting about Spufford’s novel, where he was very sympathetic to the work of various Ukrainian and Russian cyberneticians and taking into account the eventual failure and repression from the Soviet Union’s bureaucracy, is that in England and North America it was read in three entirely different ways. Two types of interpretation praised the novel. The first one, the economist would say: this is a fantastic novel, this is a story of a failure of communist cybernetics, it shows there is no way apart from what we experience now. The other reading would say – this novel shows that there was another way and if Stafford Beer and soviet cyberneticians had been successful in their attempt and created a digital real-time planning system, there would be a communism that looks very different, and is inspirational for the present in the context of this massive crisis. So I took that novel and did my best to extend the progressive logic of it. I brought up the issue not only of how automation could make possible the freeing of labor time, but also about the flows of Big Data and what we call liquid democracy, forms of participatory planning. So I went down this path and I explored this scenario and I could not fully agree. Because I think there is an obvious danger in looking at the potentiality and believing there is a teleological automatic process which will lead to its fulfillment. And I think that’s really risky. There was some work done by accelerationists. I appreciate this work, because they work on developing these potentials, but up to date, I think, they are really weak on the issue of how we get from here to there and on the question of the nature of the struggles which will be necessary. So I do not support the idea of accelerationism that we need just to speed up. I am not a luddite, but I am not an accelerationist either. There is a need for some disruption in social relations to production, another construction of the relation of ownership in order to release the forces of production in a new direction. The traditional proletariat as you mentioned in your lecture had a common space for interaction, for solidarity. They had a factory. Nowadays there is no common space for them anymore. They work in different places, have different lifestyle, vote for different parties. Is there any possible solidarity between the different parts of these very much fragmented parts of the Cyber-Proletariat? Where will the solidarity be built? Yes, that’s the problem. You are correct in noting that there is a huge, and maybe unsurpassable barrier on the way to class organisation. At the same time there is another significant trend, that could be called a proletarianisation of sectors of all professions and also the digital professions. For some decades, but particularly sharply in 2008 we have seen situations in which people whose career ladder aspirations and education were structured in expectation of high-status, high-reward jobs coming out of technological trajectories, suddenly finding themselves in situations of unemployment, highly precarious work to hustle from one contract to another, at the same time carrying loads of debt. And we are talking not just about people who have been catapulted in this world of temporary and insecure quasi-professional work. There are those who have been ejected from it completely. I got a letter from a doctoral student from my program who had a doctorate in life and information science, a desperate letter asking for help to find a job. He was working to support his family as an agricultural labourer, in Canada. There are people who have completely plunged out of the framework of their expectations and I am sure you also know them, as much as I do. So that’s why I think the discourse around precarious work has been so important. Because it does actually start to provide the language that can connect some of these otherwise extraordinarily disparate situations like those of a fast-food worker, a tester at a video-game company, or a contract-based marker at a university. It is not a magic bullet and it would be obscene of me to diminish problems, but I do think that this is one line which is extremely important to follow: the question of temporary, insecure, and partial wage-work. Do we have the right to call the enormous army of programmers “the new dangerous class”? No, not entirely. There is a division in the class of programmers. There are obviously the sections particularly at the upper strata, that are very well paid, top technology designers, who tend to be highly identified with capital and if we are looking at Silicon Valley companies like Google, Facebook, they are really at the frontier of attempting to make high technology capital hegemonic under the label of things like the sharing economy. They are a dangerous class, in a sense that their aspiration is an entirely new intensity of marketisation and commodification of the planet and daily life. But among them there are whole legions of people whose work is unpaid, poorly paid, precarious and they indeed are among the groups which have potential to be the highly dangerous class, in the sense of the word, highly dangerous to capital, because they have know-how and they are prepared to use it. So, yes, sure, a dangerous class, but dangerous to whom? What are the alternatives to the oppressive regime we have and the dystopia the developing technologies can bring? Often the new technologies are associated with anti-capitalist potential (free copying of information, 3D-printers, etc). Does it make sense? How far can such grassroot technological erosion of capitalism go without conscious revolutionary action?